The summer seems to have flown by and now we are in the last days of it before school starts! I want to soak up every bit of it with my kids before school is in full swing. It’s also a time to gather up easy recipes that I’ll be making in the coming months for dinners. The last thing I want to think about when I am busy is what to prepare to eat. I need simple recipes that can either be prepped ahead of time or cooked up really fast. 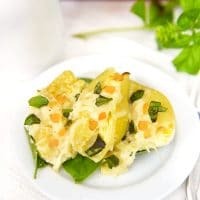 This recipe for Butternut Squash Stuffed Shells with Brown Butter Cream Sauce is both fast and easy to prepare. Almost every recipe I’ve seen for butternut squash in a pasta dish calls for roasting and peeling the squash before any other prepping. 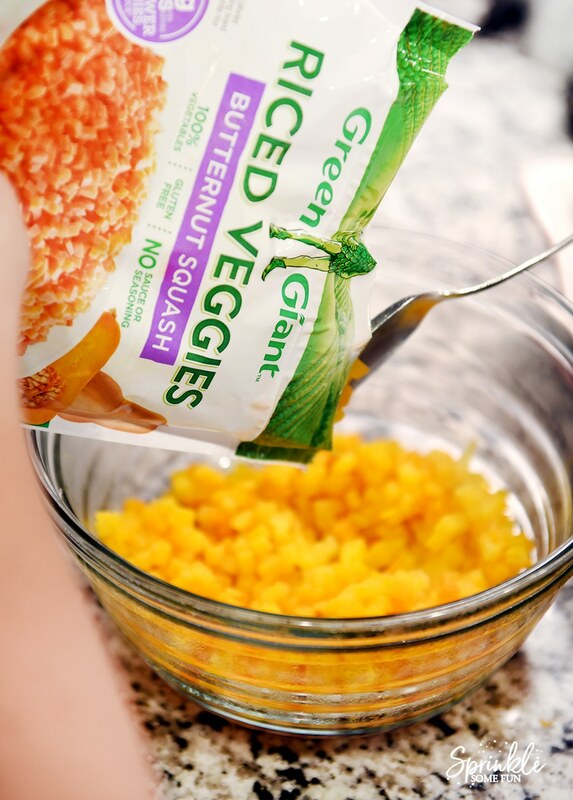 I am using Green Giant Riced Veggies Butternut Squash instead because it saves me so much time! 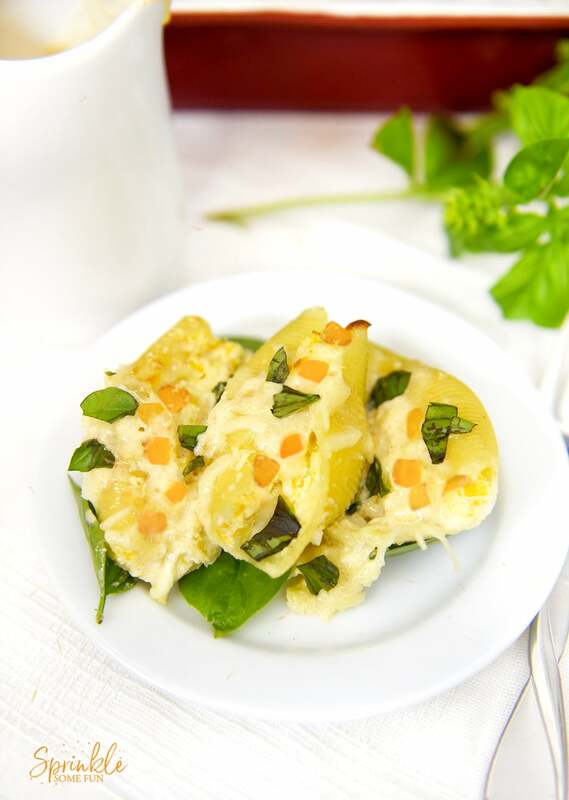 It takes 6 minutes to prepare and the taste is fresh and wonderful! The Green Giant Riced Veggies have no sauces or seasonings which makes it a convenient addition to any meal. 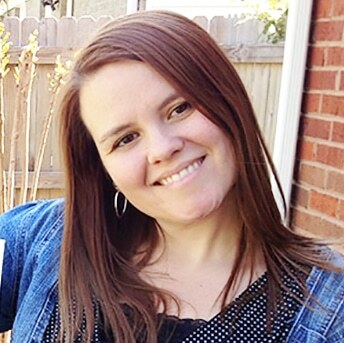 They are also great for our family because they are a gluten free, low-calorie food with up to 85% fewer calories than the leading brand of white rice! Check out the $1.00 off coupon from Green Giant they are offering now! 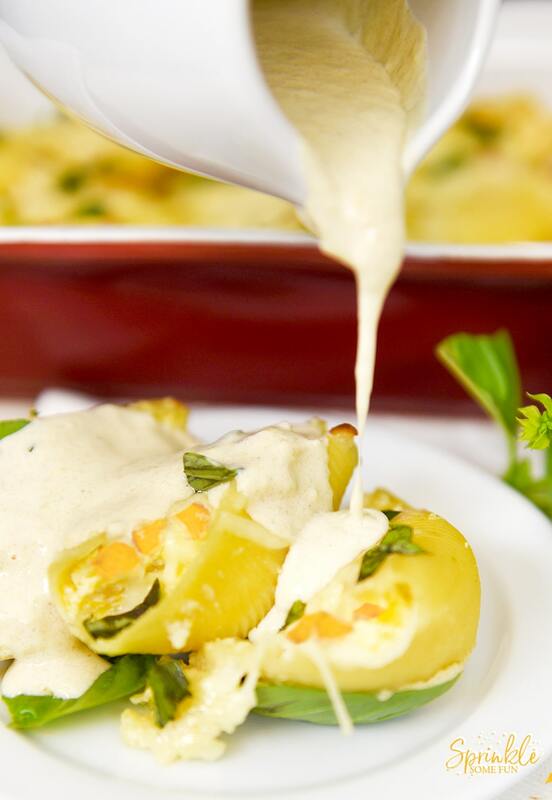 The subtle sweetness of the Butternut Squash Stuffed Shells goes well with this browned butter cream sauce. If you’ve never tried browned butter then you are missing out! It’s just butter simply cooked on the stove until it gets to a deep golden brown color. Add to that some heavy cream, parmesan cheese and just a touch of garlic. This sauce is subtle so it didn’t overpower the filling, but the browned butter is what makes it amazing. Finally top off the dish with some fresh basil. The result is a creamy, subtly sweet, and cheesy filled noodle goodness! I can’t wait to make Butternut Squash Stuffed Shells again! In a large boiling pot of water add the pasta shells and cook until tender and drain. Once drained, return to the pot and add oil or butter to keep the shells from sticking together while you make the filling. Meanwhile cook the Green Giant Riced Veggies Butternut Squash in the microwave according to package directions. Set this aside once finished cooking to cool off for a minute. In a large bowl add the butternut squash (minus the 1/3 cup for topping, parmesan cheese, ricotta cheese, salt, and garlic (pepper if wanted). Mix until combined and this is the filling. 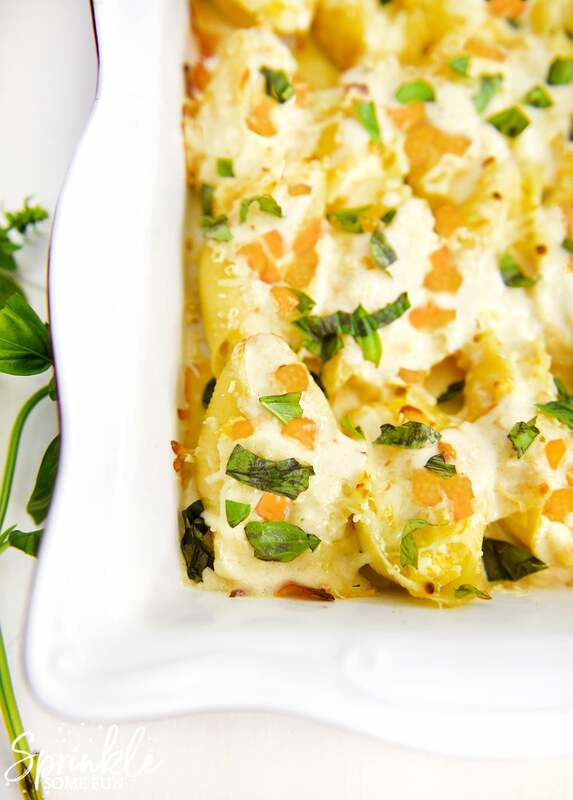 Take a 9X13 casserole dish and butter the bottom of the dish before adding any ingredients. Take one cooked pasta shell and add 2 Tbsp. of filling inside and set in the dish. Repeat this process until the dish is filled. I like to put 4 or 5 shells in a row before starting the next row. Once your rows are complete sprinkle on the remaining cheeses and the extra butternut squash on top. Bake at 350 degrees for 15-20 minutes or until the cheese is starting to bubble and brown. Take out of the oven and set aside for the sauce. Also add the fresh basil to the top of the shells. As the shells are baking make the sauce. In a medium pot add the butter and cook the butter on medium heat. The butter will melt and then start to turn a caramel brown color. At this point turn the heat off and wait a couple of minutes to add the heavy cream, garlic and reserved parmesan cheese. If you add these too hot the cream and cheese will curdle. Whisk the ingredients together and set aside. At this point you can add the browned butter cream sauce to the dish by drizzling it all over or drizzle it on top once the shells have been plated. enjoy! 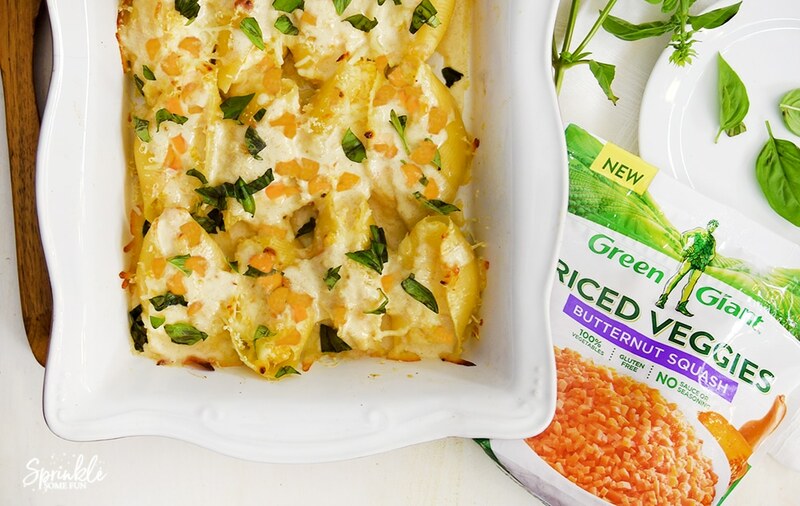 Be sure to check out the Green Giant Riced Veggies Sweepstakes below! It’s easy to enter.